Objective: To investigate the efficacy and feasibility of an intensive combination treatment in early rheumatoid arthritis (RA) combined with monitoring both disease activity and cartilage degradation. Methods: In a pilot trial, 21 patients with active early RA (mean DAS28 5.3; mean disease duration 3 months) were treated with COBRA treatment comprising sulfasalazine, methotrexate and high-dose step-down prednisolone, intensified by adding hydroxychloroquine and continued low-dose prednisolone. In addition, based on measurements of disease activity or a marker of cartilage degradation (CTX-II), treatment adjustments were possible with methotrexate intensification after 8 or 21 weeks; and with infliximab after 21 weeks. Results: Nineteen of 21 patients (90%) were in remission (DAS28 <2.6) after 40 weeks (8 weeks, 57%; 21 weeks, 76%). American College of Rheumatology (ACR) criteria, ACR20, 50, 70 and 90 improvements rates were 100%, 95%, 71% and 43% respectively. CTX-II excretion decreased by mean (SD) 347(292) ng/mmol creatinine, but only 50% of patients reduced their CTX-II excretion below the cut-off point. The two monitoring groups showed no significant difference in remission according to DAS score or CTX-II excretion, despite a trend towards more intensive treatment in the CTX-II group. Treatment intensification was feasible according to protocol. Conclusions: This small pilot study suggests that intensified and tightly controlled COBRA treatment is uniquely effective in early RA. The initial aim of this pilot study was to compare the feasibility of tight control based on the measurement of disease activity or cartilage degradation and to test the acceptability of an intensification of the original COBRA schedule to further increase response. This intensification comprised the addition of hydroxychloroquine, based on the results of O’Dell et al12 and the possibility of adding infliximab after only 21 weeks. We report the unexpectedly favourable results of this treatment regimen on remission. Patients were recruited between July 2004 and November 2005 in the Jan van Breemen Institute and the VU University Medical Center, Amsterdam, The Netherlands. Eligible patients had RA according to American College of Rheumatology (ACR) criteria diagnosed 36 months or less prior to inclusion, and active disease defined by DAS28 greater than 3.2. The DAS28 is a validated index of disease activity that includes a count of 28 joints assessed for swelling and tenderness, a measure of an acute phase reactant (erythrocyte sedimentation rate), and a measure of global well-being. The study protocol was approved by review boards in both centres; all patients gave written informed consent. Patients were randomised into two monitoring groups: treatment was intensified when disease activity (DAS group) or cartilage degradation (CTX group) remained above target (see below). This report focuses on the rate of DAS28 remission (DAS28 <2.6). In each centre a trained research nurse not involved in treatment decisions assessed the patients. Cartilage degradation as reflected by urinary excretion of C-terminal cross-linking of type II collagen (CTX-II), was measured by ELISA in the Synarc-laboratory (Lyon, France). Patients, the treating physicians, and assessors were blinded for allocation to the monitoring groups. Both groups were treated with COBRA treatment intensified by the addition of hydroxychloroquine, an increased starting dose of methotrexate, and no further tapering of prednisolone beyond 7.5 mg/day. Specifically, the regimen comprised hydroxychloroquine (400 mg/day), sulfasalazine (2 g/day), methotrexate (10 mg/week) and tapered high-dose prednisolone (60 mg/day (week 1); 40 mg/day (week 2); 30 mg/day (week 3); 20 mg/day (week 4); 15 mg/day (week 5); 10 mg/day (week 6); 7.5 mg/day (thereafter until end of trial)). Treatment was intensified in two steps when the predefined targets were not met. In the group monitored by disease activity the target was DAS28 ⩽3.2; in the group monitored by cartilage degradation the target was CTX-II ⩽150. The DAS28 target was chosen to correspond with Dutch standards of reimbursement of anti-TNF treatment and is defined by the European League Against Rheumatism (EULAR) as low disease activity. The CTX-II target was chosen based on follow-up research of the COBRA trial where patients with a CTX-II excretion below 150 nmol/mmol creatinine showed almost complete arrest of radiological progression.13 When the target (DAS28 or CTX-II, respectively) was not met at 8 weeks, MTX was intensified to 25 mg/week; if still not met at 21 weeks infliximab was offered to patients on high-dose MTX, and MTX was intensified in the remainder. The protocol ended after 40 weeks; the treating physician was then at liberty to start alternative therapies. Results were checked for normality by visual inspection and differences between groups were tested by t-test in case of normality and an appropriate non-parametric test otherwise. Differences between categorical variables were tested by χ2 test. Twenty-one patients were included in the trial. All patients had early and active disease, with a mean disease duration between diagnosis and inclusion of 3 months. One patient was included 19 months after diagnosis, while all others were diagnosed less than 8 months before inclusion. The mean DAS28 (SD) was 5.3 (0.8). The groups were well matched at baseline (table 1). Overall, 90% of patients (19 of 21) achieved a DAS28 remission after 40 weeks of intensive treatment (95% confidence interval, 70–99%; fig 1). One patient dropped out at 28 weeks to work abroad; she was in remission at 21 weeks. Given the reason for drop-out, this patient was assumed to be in remission at 40 weeks. Response was brisk with 57% in remission after 8 weeks, and 76% after 21 weeks. The mean (SD) DAS28 after 40 weeks was 1.6 (1.1) and the duration of remission for the 19 patients was mean (SD) 28 (11) weeks. ACR improvement rates are shown in fig 2. Mean ACR response, expressed in the new ACR hybrid measure was 79.0 (17.6).14 There were no differences in response between the monitoring groups. Figure 1 Disease activity (DAS28) during 40 weeks of intensive treatment in the two monitoring groups. Remission is defined as DAS28 <2.6 (top panel light grey shading). 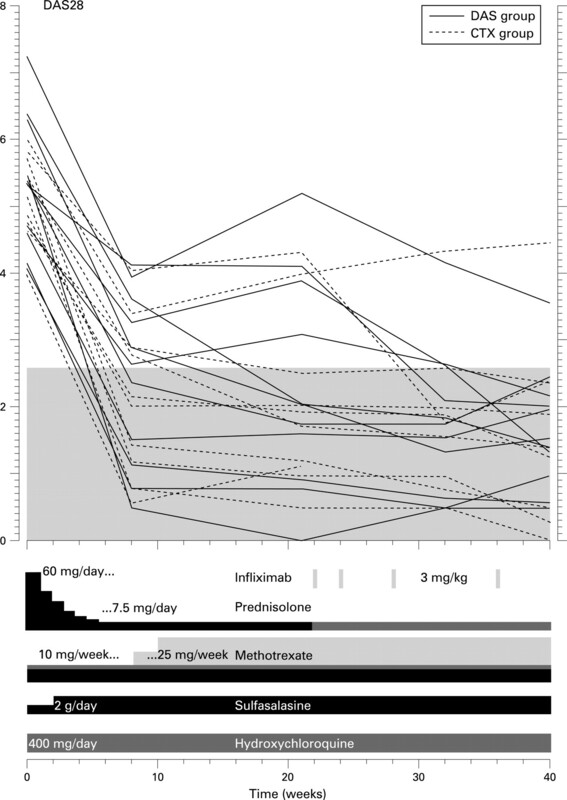 Lower panel: all patients received the original COBRA schedule (black), intensified by the addition of hydroxychloroquine, methotrexate 10 mg instead of 7.5 mg and continuation of low-dose prednisolone instead of tapering after 28 weeks (dark grey). Decisions to intensify methotrexate and to start infliximab infusions (light grey) were made when DAS28 (DAS group) or CTX-II (CTX group) target levels had not been met. CTX-II, C-terminal cross-linking of type II collagen; DAS, disease activity score (of 28 joints). 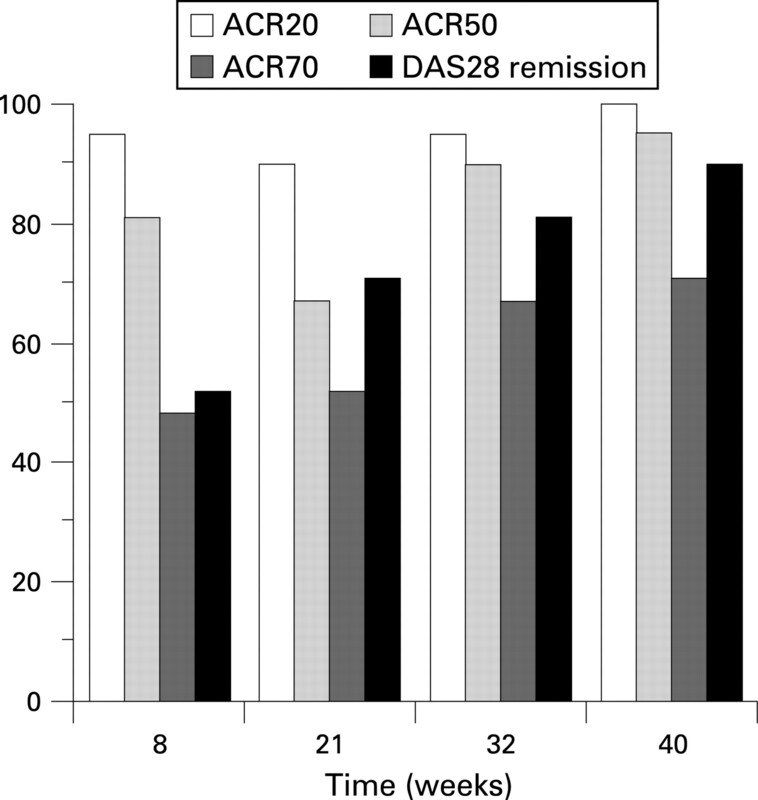 Figure 2 Percentages of ACR20, 50, 70 and DAS28 responses during 40 weeks of intensive treatment for all patients. ACR, American College of Rheumatology; DAS, disease activity score (of 28 joints). The CTX-II target tended to be more challenging than the DAS28 target. The maximum CTX-II decrease was mean (SD) 347 (292), or 57 (30) % from baseline levels. At 8 weeks, MTX intensification rates were 36% (four of 11) in the group monitored by DAS28 vs 60% (six of 10) in the group monitored by CTX-II. At 21 weeks, 27% (three of 11) vs 50% (five of 10) were offered infliximab, and 27% vs 33% accepted. Additionally, 0 vs 10% (one of 10) received MTX intensification at this time. None of these differences in treatment intensity were statistically significant. Seven patients required treatment with bisphosphonates at the start of the study; one patient was already using bisphosphonates before inclusion. In these eight patients there was a trend towards more decrease in CTX-II excretion, and more CTX remissions at week 40: 75% for bisphosphonate users vs 33% for non-users (p = 0.17). Given the protocol design, six patients in the CTX group received intensified treatment at 8 and/or 21 weeks despite being in DAS remission. In contrast, one of the two “remission failures” at week 40 reached the CTX-II target at week 8 and thus did not receive MTX intensification, despite DAS28 being above 3.2 (fig 1). In this patient, at week 21, the treating physician violated the protocol to increase the MTX dose, to which the patient did not respond. The other “remission failure” at week 40 did receive both MTX and infliximab and can be considered a true failure, although she did reach an ACR70 response, and the final DAS28 of 3.55 can be considered moderate disease activity by current standards. Eight adverse events were registered, for eight different patients, all rated low to moderately severe. Four were likely the result of the study medication, and were followed up by stopping one or two of the drugs temporarily. In terms of feasibility, the number of patients and rate of inclusion was unfortunately low due to organisational difficulties unrelated to the protocol (eg, a third centre failed to start up). Three patients were screened but excluded for safety reasons, and none for lack of consent. This small pilot study documents a uniquely high DAS28 remission rate of 90% in patients with active early RA achieved through tight control and aggressive combination treatment. Remission rate was rapid and sustained. Such a high remission rate has not been reported before and its lower confidence limit (70%) still exceeds the best results published so far. Likewise, the ACR improvement rates are also well above response rates noted in the literature. The initial trial on COBRA combination treatment showed 28% remission after 28 weeks.8 The 1-year remission rate of modified COBRA treatment in the BeSt trial (original full joint count DAS <1.6) was 32%, equivalent to high-dose MTX with infliximab.9 In trials studying combinations of conventional DMARD therapies, often tightly controlled and with varying definitions of remission,6 7 10 11 the maximum rate was 51%, with the exception of the FIN-RACo trial reporting 68%. In four recent trials on the combination of MTX with anti-TNF,4 15–17 the maximum rate was 50%. The high remission rate in our study is best explained by the intensive treatment schedule. Compared with previous trials, more drugs were used at higher doses, and treatment could be intensified as early as 8 weeks into the trial. Limitations of this study include its open approach and small sample size. Although allocation to monitoring strategy was blinded, study personnel and patients were aware that treatment consisted of a very effective treatment. This may have exaggerated the response, but a 90% remission rate is unlikely to be caused by expectation bias. This study suggests that the use of bisphosphonates might result in a greater decrease of CTX-II in urine during intensive RA treatment, an important point to consider in future studies. Nevertheless, this study suggests that in patients with early RA, tight control and early aggressive treatment through an intensified COBRA strategy can result in almost complete DAS28 remission rates. The authors wish to thank Anke van Rees (Jan van Breemen Institute) and Michelien Kolff (VU University Medical Centre), for their large contribution to the conduct of this study.
. Rheumatoid arthritis. Pathophysiology and implications for therapy. N Engl J Med 1990;322:1277–89. .Evaluation of the preliminary definitions of minimal disease activity and remission in an early seropositive rheumatoid arthritis cohort. Arthritis Rheum 2007;57:440–7.
. Preliminary criteria for clinical remission in rheumatoid arthritis. Arthritis Rheum 1981;24:1308–15. .The PREMIER study: a multicenter, randomized, double-blind clinical trial of combination therapy with adalimumab plus methotrexate versus methotrexate alone or adalimumab alone in patients with early, aggressive rheumatoid arthritis who had not had previous methotrexate treatment. Arthritis Rheum 2006;54:26–37. .Comparison of different definitions to classify remission and sustained remission: 1 year TEMPO results. Ann Rheum Dis 2005;64:1582–7. .Effect of a treatment strategy of tight control for rheumatoid arthritis (the TICORA study): a single-blind randomised controlled trial. Lancet 2004;364:263–9.
. Remission and response to early treatment of RA assessed by the Disease Activity Score. BARFOT study group. Better Anti-rheumatic Farmacotherapy. Rheumatology (Oxford) 2000;39:1031–6. .Randomised comparison of combined step-down prednisolone, methotrexate and sulphasalazine with sulphasalazine alone in early rheumatoid arthritis. Lancet 1997;350:309–18. .Comparison of treatment strategies in early rheumatoid arthritis: a randomized trial. Ann Intern Med 2007;146:406–15. .Sustained remission and reduced radiographic progression with combination disease modifying antirheumatic drugs in early rheumatoid arthritis. J Rheumatol 2007;34:316–21. .Intensive treatment with methotrexate in early rheumatoid arthritis: aiming for remission. Computer Assisted Management in Early Rheumatoid Arthritis (CAMERA, an open-label strategy trial). Ann Rheum Dis 2007;66:1443–9. .Treatment of rheumatoid arthritis with methotrexate alone, sulfasalazine and hydroxychloroquine, or a combination of all three medications. N Engl J Med 1996;334:1287–91.
. Arthritis instantaneously causes collagen type I and type II degradation in patients with early rheumatoid arthritis: a longitudinal analysis. Ann Rheum Dis 2006;65:40–4. American College of Rheumatology Committee to Reevaluate Improvement Criteria. A proposed revision to the ACR20: the hybrid measure of American College of Rheumatology response. Arthritis Rheum 2007;57:193–202. .Comparison of etanercept and methotrexate, alone and combined, in the treatment of rheumatoid arthritis: two-year clinical and radiographic results from the TEMPO study, a double-blind, randomized trial. Arthritis Rheum 2006;54:1063–74. .Combination of infliximab and methotrexate therapy for early rheumatoid arthritis: a randomized, controlled trial. Arthritis Rheum 2004;50:3432–43. .Comparison of methotrexate monotherapy with a combination of methotrexate and etanercept in active, early, moderate to severe rheumatoid arthritis (COMET): a randomised, double-blind, parallel treatment trial. Lancet 2008;372:375–82..
.Minimal disease activity for rheumatoid arthritis: a preliminary definition. J Rheumatol 2005;32:2016–24.
. Twenty-eight-joint counts invalidate the DAS28 remission definition owing to the omission of the lower extremity joints: a comparison with the original DAS remission. Ann Rheum Dis 2006;65:637–41. Funding: This study was supported by an unrestricted research grant from Schering Plough BV.